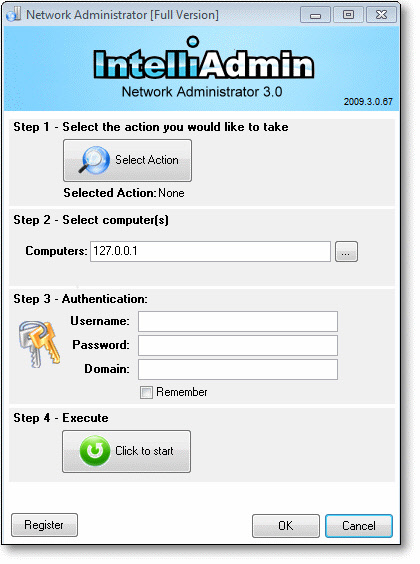 Network Administrator allows you to make tweaks, changes, and updates across your network. It has an amazing plugin system that is packed full of actions. Easily update those older NT 4.1, Windows 2000, and XP machines to the latest DST settings without being forced to purchase a $5000 patch from Microsoft. Keep users from installing unwanted software. Disable and enable their CDROM / DVD drives with ease. Keep users from copying data off your network. Disable DVD and CD burning while allowing users to still have read only access. Having a problem with users sending Excel 2007 documents to people outside your network? Reduce those help desk calls by forcing all of your Excel 2007 users to automatically save in the 2003/XP format. Prevent users from accessing their floppy drives and installing unwanted software. Have a set of shortcuts you want to copy to everyone's desktop? Or a configuration file you need to place on their C Drive? Use the folder copy plugin to copy files and folders to many machines in just a few clicks. Need to keep IE 6 on your network, and want to prevent those dreaded calls after users install IE 7? Use the IE 7 blocker to prevent the automatic install of IE 7.